A long-running shortage in donor organs has pushed doctors to find ways to use those with hepatitis C, an infection that is increasingly common in the United States due to the opioid crisis, and which can be cured with medicine. Some US hospitals, particularly in Boston, have already transplanted infected donor organs into people without hepatitis C. These patients are swiftly treated with drugs to eliminate the virus. In Toronto, Canada, another team of doctors on Thursday announced early results from a trial using a different technique, involving 10 people who received lung transplants from donors with hepatitis C.
Infected donor lungs were placed in a sterile dome for six hours, and treated with medication to reduce the level of virus. Then, they were transplanted into the patients. Doctors were not able to fully eliminate hepatitis C from the donor lungs this way, as they'd hoped. But they cut it by 85 percent. Patients who received the lungs were subsequently diagnosed with hepatitis C, then treated for 12 weeks with a drug combination—sofosbuvir-velpatasvir, known by the brand name Epclusa—to cure it. The patients tested negative for hepatitis within three weeks of treatment, on average. Surgeon Marcelo Cypel, who led the trial and presented the results at the Global Hepatitis Summit in Toronto, said the results are encouraging because they enlarge the donor pool. 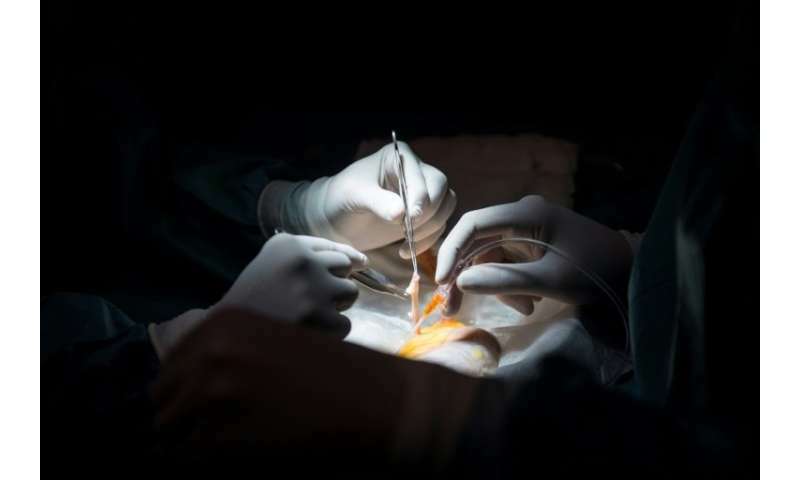 "Patients waiting for lung transplantation have a chance of dying of about 20 percent waiting for an organ," Cypel, a thoracic surgeon at Toronto General Hospital, told AFP. "The risks and benefits are much more balanced to the benefits here, because they can get organs sooner." The organs tend to be "excellent quality" in general, he added. "Hepatitis C is often really the only issue." Allowing hepatitis C positive donors would increase the number of lungs available for transplant by 1,000 per year in North America, Cypel estimated. About 2,600 lung transplants are done each year in Canada and the United States combined. An epidemic of overdoses due to opioids like heroin, painkillers and fentanyl has driven a major increase in deaths in the United States, where more than 42,000 people died of overdose in 2016. Experts say this crisis is leading to a surge in the number of organs available for transplant.